As we begin to wrap up Q1 2018, I thought it would be interesting to examine the six major food trends that Food Dive believes will have a major impact in 2018. While all these trends are of interest, some are incidental to manufacturing. These trends are less likely to directly affect the plant floor. For instance, the increased prevalence of science-based foods such as cell-cultured meat and plant-based meat, while interesting, is not yet at the scale where manufacturers outside of those specialty areas need to be concerned about the implications. Others, such as an increased use of botanicals, growing demand for “comfort food” and increased adoption of Asian and Middle Eastern flavors are potentially more impactful depending on the specific products that a manufacturer delivers. However, there are two food manufacturing trends that will be extremely important for F&B manufacturers across a variety of markets and end-users – sustainability and transparency. Join our 3/20 webinar with Food Engineering and Kwik Trip to see how digital quality management helps you provide the transparency customers desire today. Perhaps the most significant trend is sustainability. Beyond consumers looking for brands that share their commitment to environmental sustainability, are underlying drivers of food production; water, power, both of which are already under pressure in high population growth regions. This means optimizing energy and water consumption is extremely important to just limit environmental impact, but also to ensure future operations. 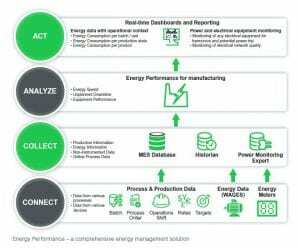 Digital energy management allows users to correlate energy data with production and process information into actionable metrics and KPIs, allowing operators to make the optimal adjustments to improve energy efficiency. By doing so, companies can continuously improve their sustainability. They can also improve operational efficiency by correlating production events with unusual energy usage patterns or variation in energy consumption. This also helps to improve profitability, because energy is one of the highest costs of F&B manufacturing. The second trend is transparency. Food Dive states of the transparency movement, “Recently, it has extended beyond [clean] labels to include product traceability as shoppers grow more interested in where their food comes from and how it was handled along the supply chain.” Consumers are now demanding to know more than ever about how their food was grown, handled, shipped, produced and packaged. This makes transparency one of the most important food manufacturing trends to building consumer trust. Digital transformation of inventory and production operations allows complete end-to-end traceability from receiving materials to shipping completed products, enabling companies to provide the complete traceability consumers demand. This also extends to ensuring products are properly labeled. Mislabeled products and undeclared allergens are the leading cause of recalls. 100% label checks help to reduce the risk of recall and ensure the right product is in the right packaging. To learn more about food manufacturing trends, the importance of digital quality management and end-to-end traceability, join our March 20 webinar with Food Engineering. You’ll learn how Kwik Trip digitally transformed their operations to achieve end-to-end traceability within the plant.